Don't cry! It's only me. I love that joke (Dork)! 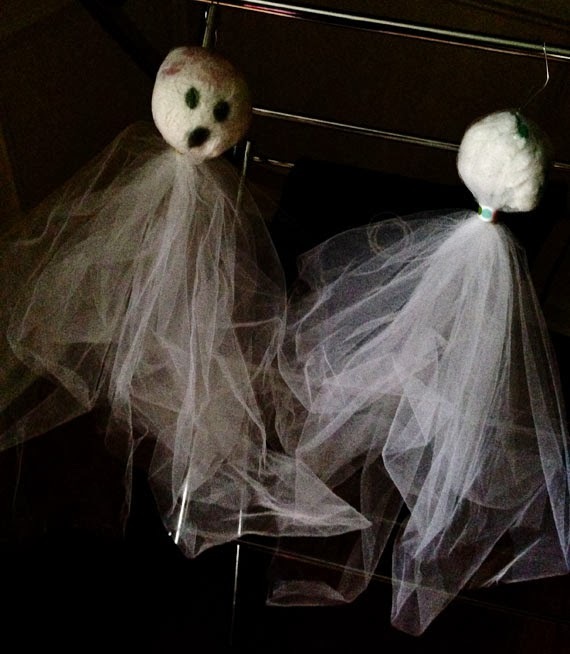 We made these ghosts the other day. The kids crumpled up white grocery bags into little balls. I gave them each a piece of tulle that I folded in half. We put the grocery bag ball in the middle of the tulle and draped it all around. We secured with a rubber band and then finished off with a little piece of ribbon. Then we used black markers to draw a ghost face on it. I would have loved to use buttons for this, but I didn't have any. My friend asked me for some help with her Halloween Costume. She is a teacher and her school is having a Disney theme for all staff. 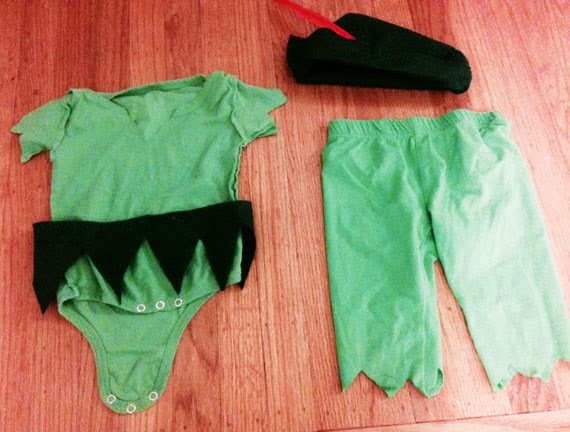 She decided to be Peter Pan. 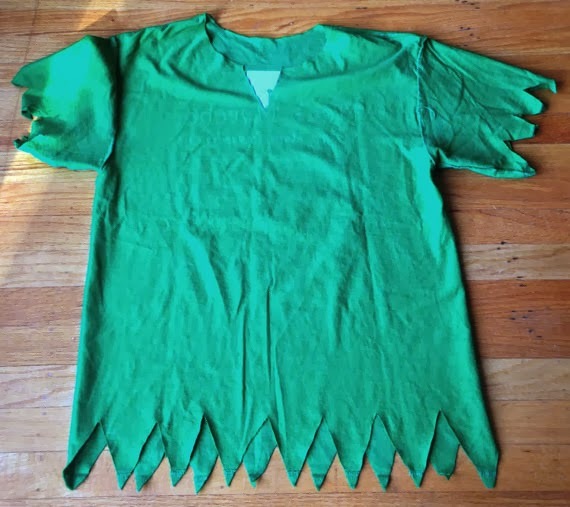 I asked her to get me a green t-shirt or tunic and a piece from a bolt of felt. I think she got me about a half a yard; it was more than plenty. I started by cutting the shirt at the bottom and on the sleeves to give it a fringe look. Next I cut the collar off of the shirt and cut a v in the front. I asked her to measure her head. It was 23 inches. Same as mine, so I used myself to measure the fabric before I cut it. I folded the fabric, then I cut it like this. Next I took hot glue and put glue inside the two pieces of felt all along the edge. Then I flipped the hat inside out or right side in depending on how you look at it. I flipped up the brim and added a red feather. I made one for William too. Anna is being Wendy, Addie is being Tinkerbell, Bill is going to be Captain Hook ,and I am going to be Izzy. I know we ARE dorks! My house is not done being decorated. I can no longer use the "I just moved in" or "I have a baby" excuse so I'm now using the "I'm waiting for inspiration" line. One of my projects that needed inspiration is my hallway in the front entrance. It's a ten foot wall so I considered a collage of pictures but I can never decide on pictures. I always think that I'll want to keep the pictures updated so I wait for the next round and never put them up. On a nightly perusal of Etsy I found these really cute pictures of British images on dictionary pages and I thought it was such a fun idea. I thought I might want to try something like that myself so Alan and Kristen found us some dictionaries at Goodwill Outlet for 25¢ each. Yesterday I was trying to think of a project in which both kids could participate and keep them happy. They had a long day with their grandparents on Saturday and needed some downtime. I pulled out the dictionary, cut out some pages and gave them watercolors and dot paint. The kids were taken by it! They both painted for a long time and Alan even got in on the action! When they were finished I had an idea. I had a bunch of frames from Ikea that had been waiting for pictures so I framed them. Here's the thing about art: sometimes the most expensive pieces look, to me, that they could have been done by a toddler. I don't understand why a swipe of paint on a blank canvas with a fancy name could be any more valuable than something I could do. I'm probably just missing something. I decided that if I hang them in my front hallway and not tell anyone that it is kid art than maybe I'll just look cultured and appreciative of very fancy modern art. When I was little when someone was talking about catching bugs they meant they were going to go outside with a container like this and put some bugs into it. My girls are terrified of bugs. I have no idea why (I blame their dad's fear of bugs but don't tell him I told you). 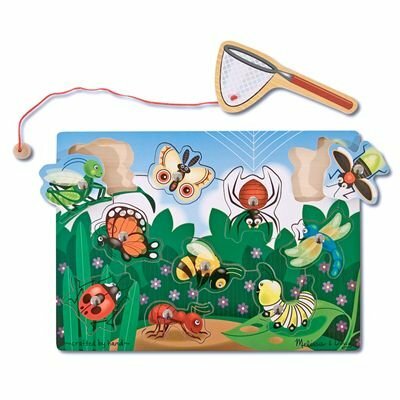 Anyway they would probably never ask to go outside and catch bugs but they do love this bug catching puzzle by Melissa and Doug. I love this puzzle because it builds eye hand coordination in a different way than a usual wooden puzzle. 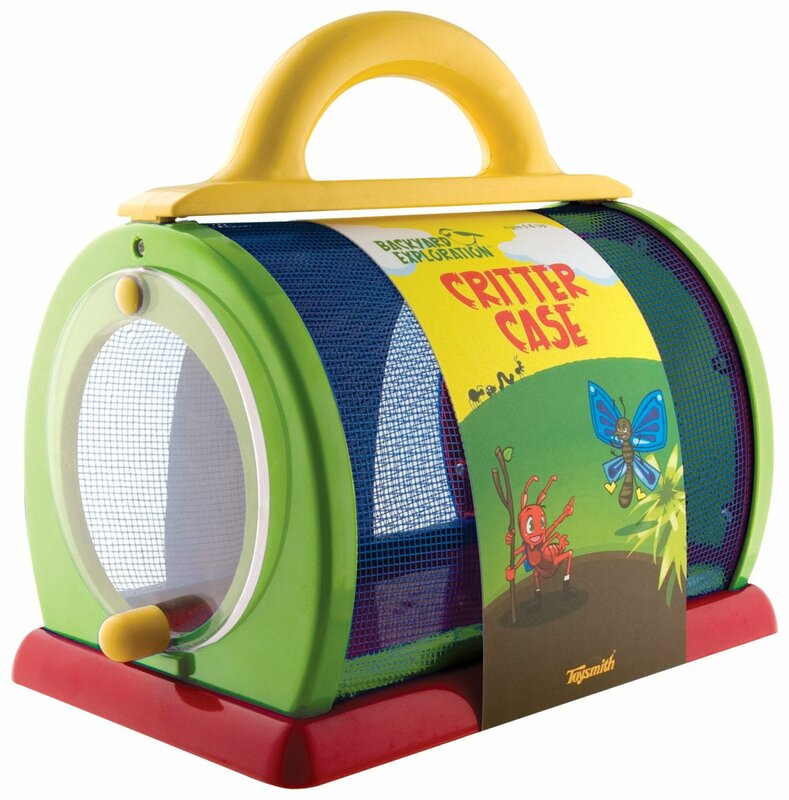 You use the bug catcher which has a magnet on the end to pick up the bugs which are also equipped with a magnet. The ages on this are 3-6 years old. 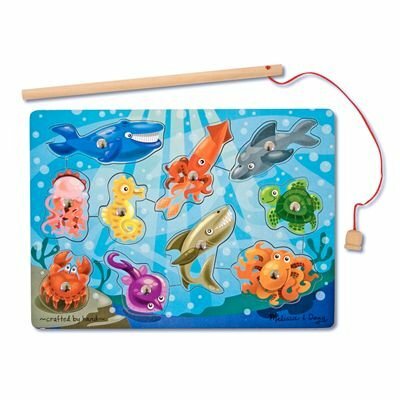 They also have this fishing puzzle which is very similar. Simon is almost two and a half. Besides the "are you having any more kids" question (NO) I get the "is he still in a crib?" YES. I grow short kids who cannot climb out of cribs and until that happens, or when he turns twenty, (whichever comes first) I will be keeping the crib intact. I love that he still has to call for us to get him out of bed so that I can just go to the bathroom by myself that one time before he gets out of bed! Our current problem is that sometimes he wakes up at the crack of dawn wanting to get into our bed. In perfect land we would just ignore him and he would fall back asleep but he has figured out the magic words, "Mommy, Daddy, I need to make a pee-pee!" How can you ignore that? Unfortunately the progression goes: first bathroom and next Mommy and Daddy's bed. When Maya was past this point I learned about these OK to Wake! Children's Alarm Clock and Nightlight that teach your kids to stay in bed. If the light is one color they have to be in bed and when it's another color they are free to get out of bed. My theory is that if Simon uses that clock while still in his crib it will help his transition to a big boy bed. I'm hoping that he will get the idea for when he has to go to the bathroom at night too, if the light is still the "sleeping" color than he will have to go back to bed! My kids are obsessed with making cards for people. Recently Anna made a card for a relative and she sealed it and asked me to send it. I had no idea what she wrote on it. The relative disclosed that it said Happy Halloween and that she loved her. How sweet! Also, after Addie's party Anna insisted on helping to decorate the thank you notes. Don't most kids protest writing thank yous? Not mine. It is their favorite part of holidays. Everyday she would beg me to work on them. Do you know someone who loves crafts and making cards? If so this would make the perfect present. It comes with 20 cards and envelops, a glue stick, six sheets of different colored card stock (with perforated edges) and a design card. Pick a design. Punch out the shapes you need to create the design and glue them to the card. 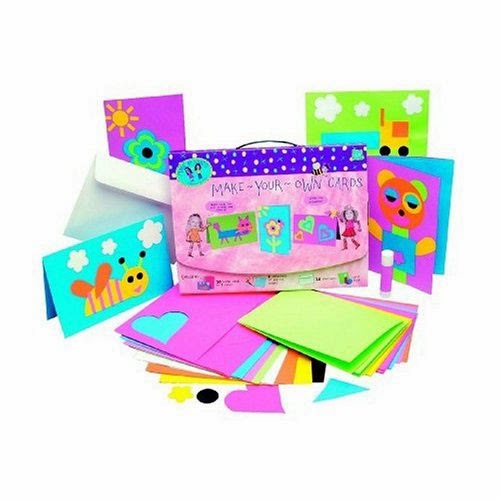 It comes with a card that shows you how to use the shapes to create the designs or you could let your child create their own designs. The cards are made out of nice quality paper and there are so many shapes that you could put more than one design on each card. Create an adorable handmade card for any occasion. When I'm awake at night I window shop online. I have my usuals, Target, Amazon and Etsy. The other day I was Etsy browsing and I typed in "worry". 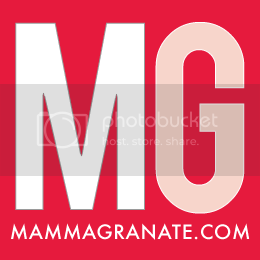 I know, not a usual search for a store but I come from a line of worriers and I love things that cater to people like me. When I was little my Grandma gave me "worry dolls" from Guatemala. The idea is that you tell them your worries, put them under your pillow and they will do the worrying for you. Convenient! Then in Ireland I purchased a "worry stone" which was basically a smooth stone to keep in your hand to rub your thumb on when you're worried. (If you are a worrier you'll know how that might help!) My sister, and fellow fidgeter, got me a worry ring which has beads that you can play with if you're feeling antsy. Maya, the poor girl, got my worrying trait. She is a thinker, her head always spinning and thinking about everything and anything. Hence my Etsy search for "worry". I expected to find a few worry rings but what I came across is Wilson the Worry Critter. It's as if he was made for Maya. You write down your worries and feed them to the monster who will eat your worries. It would make such a great conversation starter to discuss what's bothering you and a physical way to try to rid yourself of them. Plus they are extremely cute. The shop owner, Holly, said that she is working on a small version of Wilson, Wilson Jr., for my fellow worriers who focus on budgeting, aka a smaller and less expensive version! 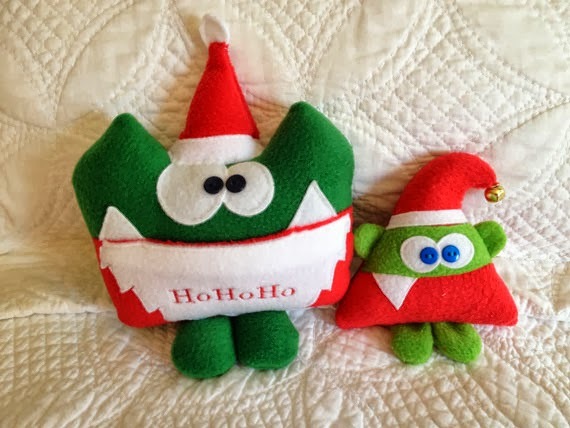 She also has a holiday version of critters which are great holiday gifts! She also does custom orders. This is amazing. 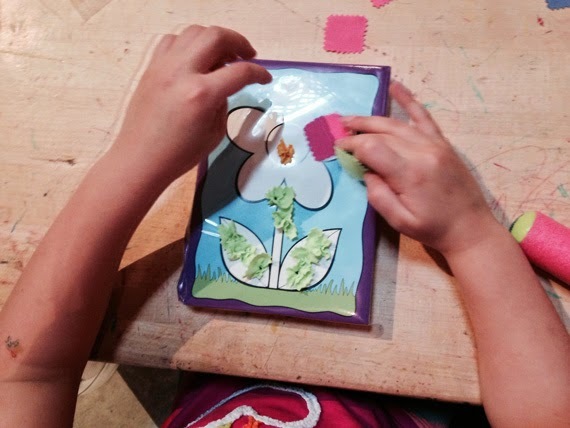 She will actually take your child's artwork and create a stuffed animal out of the picture! 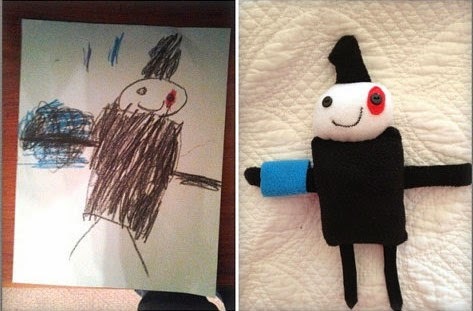 Literally bring your child's artwork to real life. I would LOVE to see all the creations she makes. If you order please send pictures!! 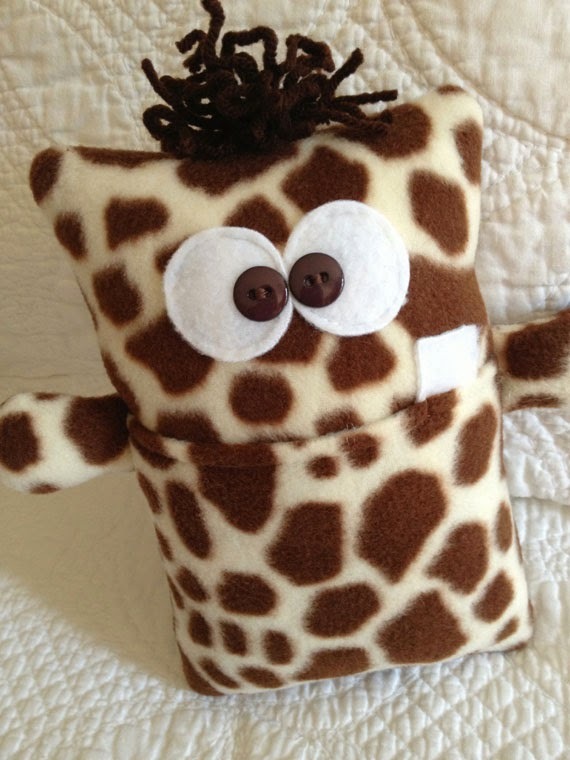 Check out the Etsy shop Kooky Critters. You can find tooth fairy pillows, worry pillows and stuffed animals. Careful, you may want one of each! My mom recently gave me a cloth called Magic Cloth, a cloth that cleans anything glass, including windshields, computer screens, mirrors, eye glasses, and much much more! I was skeptical. Without any chemicals? I decided to give it a shot. This cloth is no short of amazing. There are directions on the package that you must follow. The first time you use the cloth you must use HOT water and ring it out as dry as you can. After that you can use any temperature water. If you use the cloth and see water on your window the cloth is too wet. Just wring it out again. Washing instructions are never use fabric softener (no problem here I never do, who has time for that? ), simply machine wash and air dry. Want to purchase one of these bad boys? Just email saypop55@aol.com the cost is $4.00 plus shipping for each cloth. Have you carved your pumpkins yet? I haven't. In fact I haven't carved a pumpkin since, well, I can't remember. They are messy, don't last long and I can find cute ones I can reuse post-Halloween really cheap. The only thing I really miss is toasted pumpkin seeds. 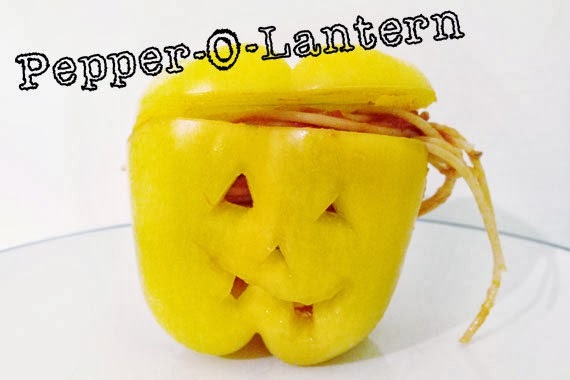 I was hoping that the pepper-o-lanterns would be so exciting that it would get my kids to eat the whole pepper along with their pasta and meatballs. Apparently it's not the case. 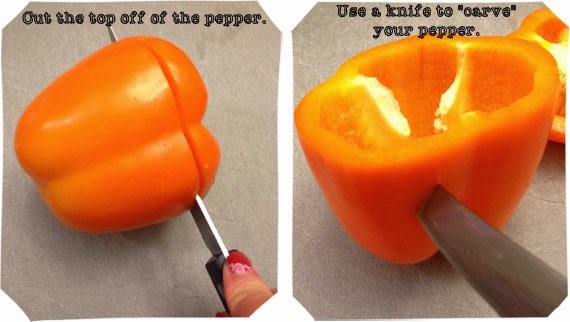 Simon, who LOVES peppers, didn't even eat it. I'll blame that on the late dinner and the fact that this almost two and a half year old does not nap. Dinner is not usually his best meal but maybe it would have been gobbled up for lunch. The pasta and meatballs though were eaten as demonstrated by his very typical spaghetti sauce face! The other day Anna asked for a paper plate. It's amazing how getting out something as simple as a plate can spark an idea for an awesome creation. She said she wanted to make a maraca. First she decorated it on one side. Then she asked me to staple shut half of it. She put a couple handfuls of Cheerios in the inside. I thought this was brilliant (her idea); it is so much less messy for her to work with than rice. Next I stapled shut the rest of it. I love clever projects. 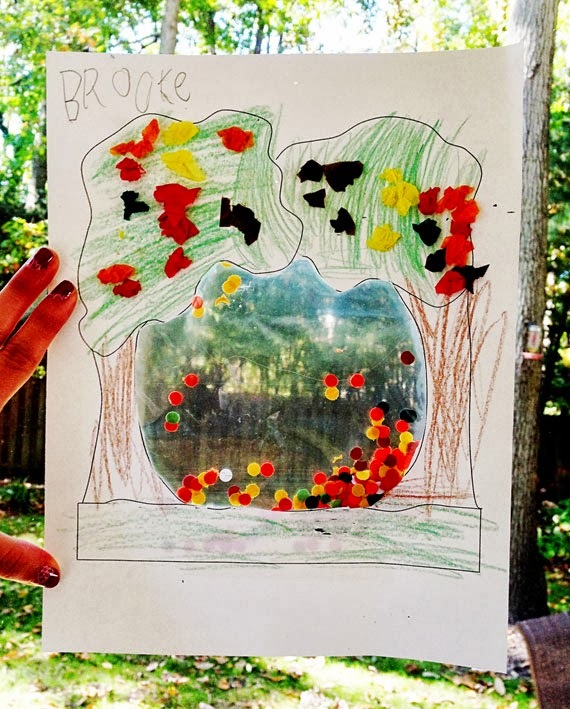 While I love seeing everything that my kids bring home from school I specifically love the projects that are different and not just a few lovely scribbles on some construction paper. 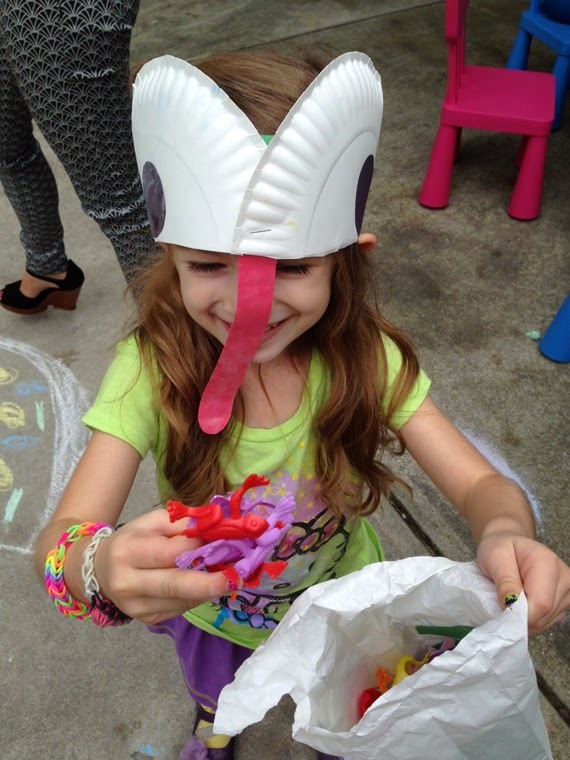 My friend, Dana, showed me a really cute project that her daughter, Brooke, brought home from school. It's something that can be easily modified for younger kids. 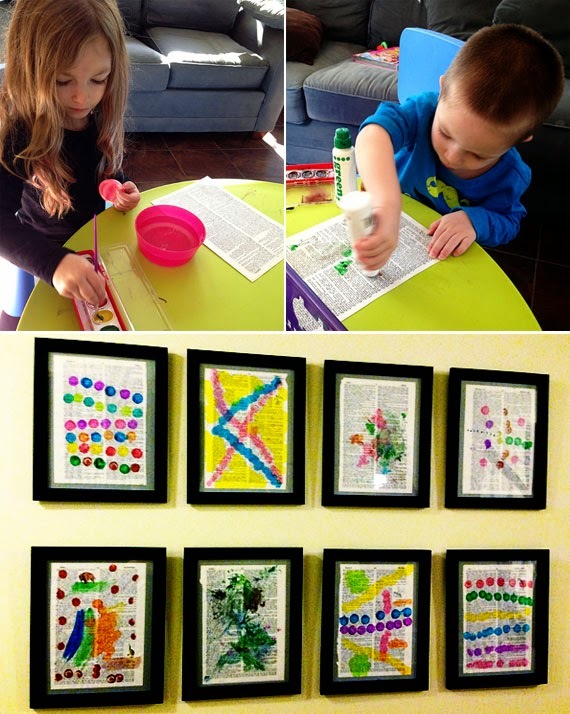 Projects that both kids can do are excellent! 1. Draw a picture of trees like the one above and cut out the center. 2. 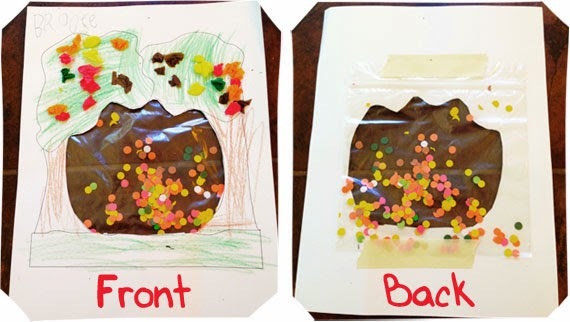 Have the kids color the trees and, if you want, glue either tissue paper bits or hole punched construction paper on the trees. 3. 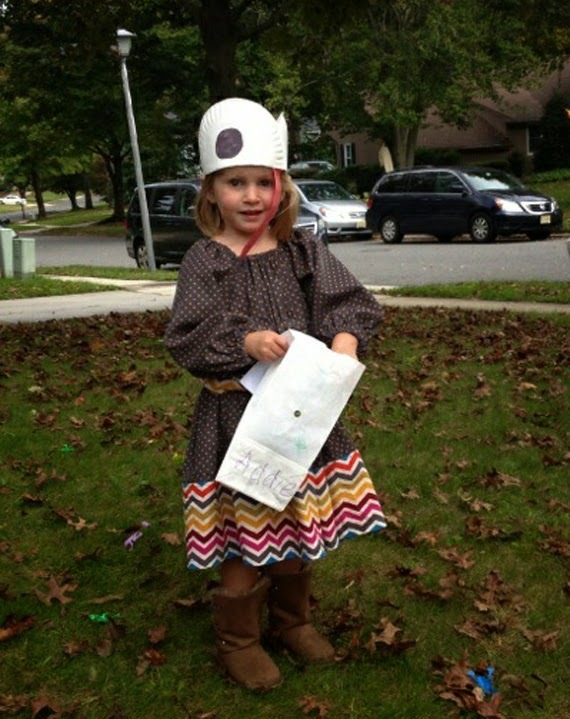 Hole punch fall colored construction paper and fill a sandwich size ziplock bag with a handful of them. 4. Tape the bag over the hole in the paper, on the back so the tape doesn't show. I took the kids to our local children's museum the other day. They have an art center that they have structured art projects for the kids to do. They do them at set times and the girls are always so excited if we happen to be there when it is open. This particular day they were doing crunch art. I had never seen this before so I quickly checked Amazon to see if they carried it and they do. It is made by a company called Little Kids. The company recommends ages 4 and up. Although, Addie (age 3) had no problem doing it. The kits come with foam activity boards with a template printed on it, crunching stylus, and lots and lots of brightly colored fabric squares. 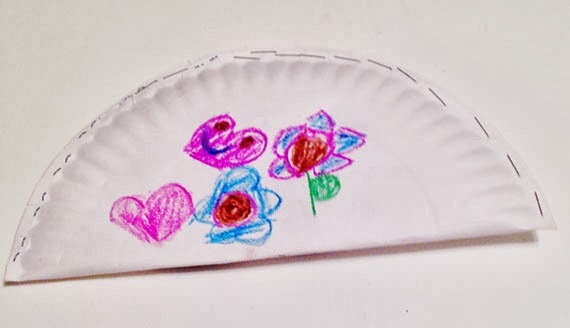 Anna's template was a flower. Here is how you do crunch art. First you take a foam activity board and place a fabric square on it where you would like it to go. 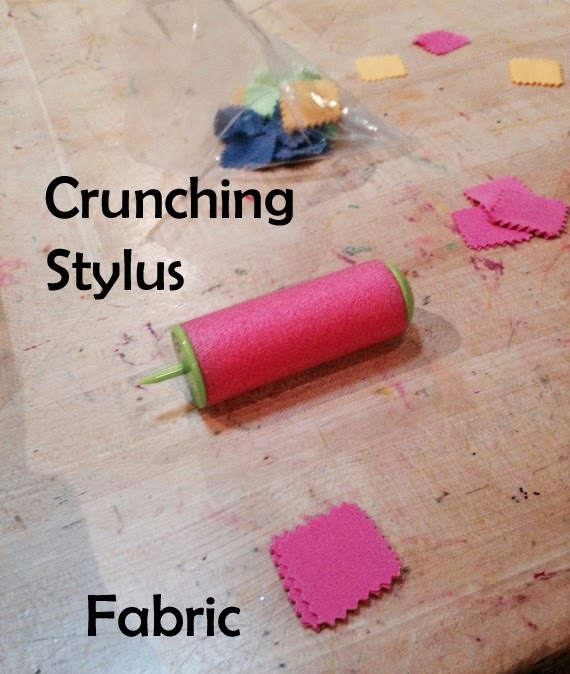 Next you take the crunching stylus and poke the center of the fabric and press firmly and the fabric will go into the foam activity board. 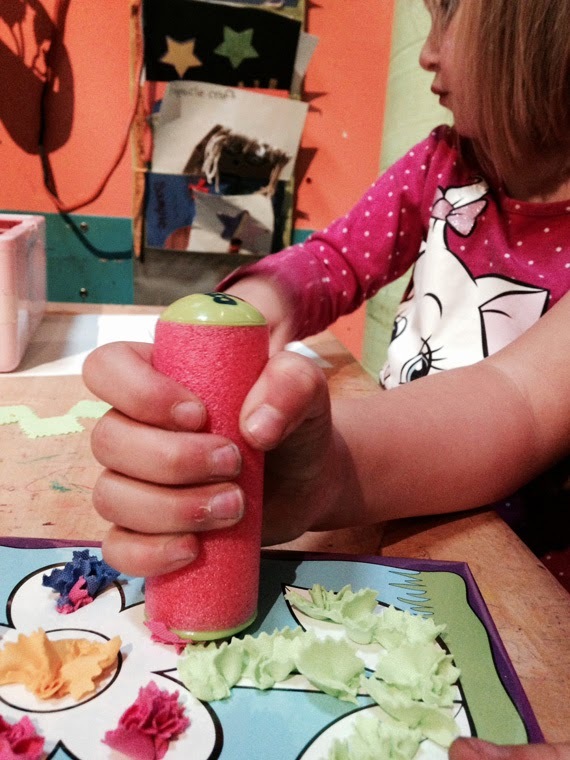 This awesome activity promotes eye-hand coordination, strength, fine motor control, and direction following. I love my family and, while I know that I spend just about EVERY WAKING MOMENT with them, I like to have something to remind me of them. What's the next best thing in my book? Jewelry! I already have jewelry that commemorates my family. Remember this and this? I still love those necklaces and wear one of them every day. My kids love looking at them and Maya always makes sure she identifies which part of the necklaces are "her". 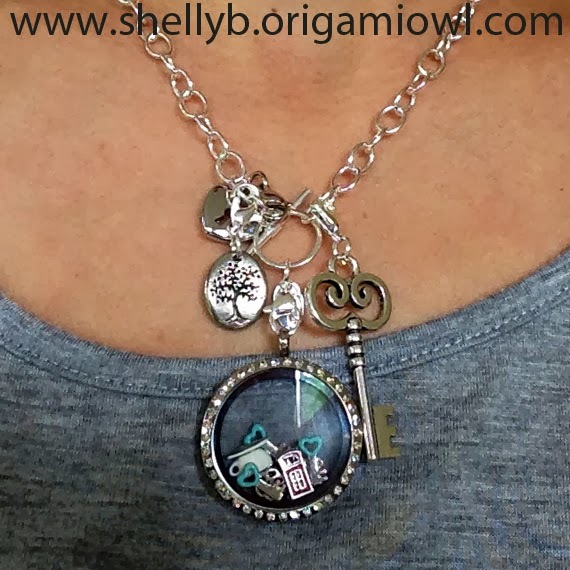 I did, however, discover Origami Owl from my college friend, Shelly, who is of of their Independent Designers. When Maya started school at two I used to write three things on her hand before school so that she could have something tangible to remind her of home while at school. I drew a heart (love), smiley face (be happy) and lips (kiss). I found charms for each of those for her necklace as well as a cat paw. I cannot wait to give it to her! For now check out my necklace. I love it! If you missed my last couple of posts I talked about the frog themed party that we had for Adelyn. I posted about the cupcakes and the frog themed games that we played. 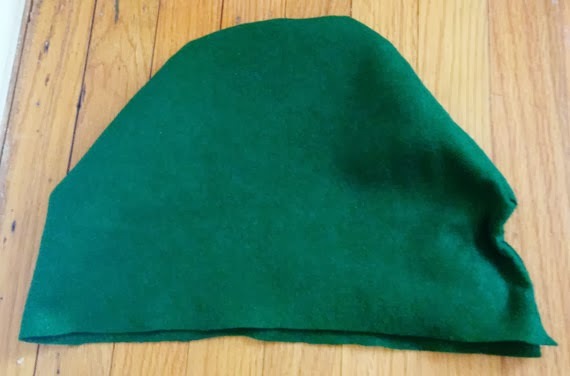 Today I am going to share the frog party hats that I made, I saw these hats on Etsy and decided to make my own version. They were very simple to make and I already had all of the supplies. It took me about an hour to make all fifteen hats. I knew that some kids would not wear the hats but I also knew that it could be a problem if there wasn't one for each kid. All you need is white paper plates (I had some left over from these), glue, scissors, stapler, green, red and black construction paper. 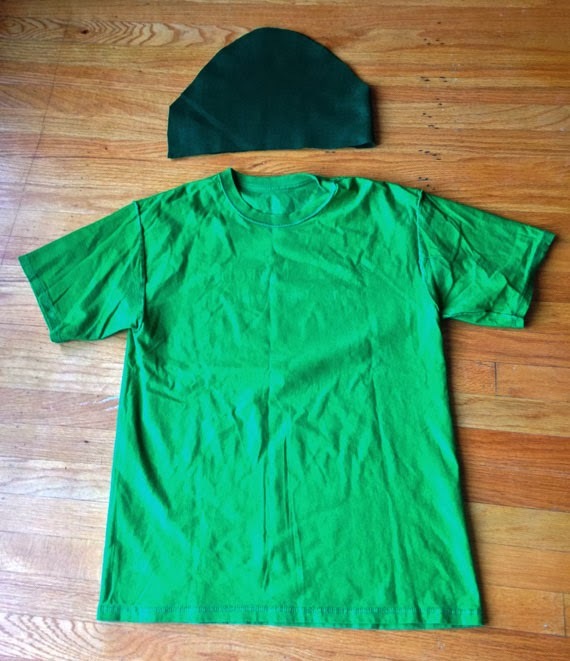 First, I took green construction paper and folded it four times length wise and then I cut on the folded lines. I stapled two strips together for each hat. Next I took paper plates and cut them in half. Then I folded sheets of black construction into squares and drew circles on them. Anna helped me cut them out. Then I cut strips of red construction paper that were curved on one side for the tongue. I used a stapler to assemble the hat. I used one staple to staple the plates (overlapping) and tongue. Then I stapled the other side of each paper plate. Anna glued each black circle onto the paper plates. When kids arrived at the party I used the hats to measure their heads and then I stapled them to fit. Anna refused to wear the hat but Simon and Maya obliged. In fact, Maya and Addie kept theirs on for the entire party. This past weekend was the event. There were two acoustic guitar players, a lot of really fun people and FOOD. A lot of people brought appetizers and desserts and I participated on the dessert front! I wanted something simple but tasty and easy to carry. (IE not cupcakes. I still have flashbacks from the drive to my nephew's birthday party worrying that the cupcakes were getting decimated in the trunk!) I turned to my trusty Pinterest board and found this goodie! I have to make a confession. I LOVE making brownies from scratch. I always use the Ghirardelli sweetened cocoa and use the brownie recipe from the side of the container. I ran out and went to Target for some errands and they didn't have it. I went up and down the aisle a few times hoping that it would appear but it did not. I used- gasp- a brownie mix. Here's the thing, I didn't pay attention. The recipe calls for brownie mix but specifically for "family size" so it would fit in the bigger pan that was pictured. If you are going to make your own recipe that calls for an 8x8 pan just bake it in an 8x8 pan. I did not pay attention and tried using a recipe for an 8x8 pan in a bigger one. 1. Choose a brownie recipe/mix of your choice and prepare as usual. 2. Pour half into a prepared pan the size recommended by your recipe. 3. 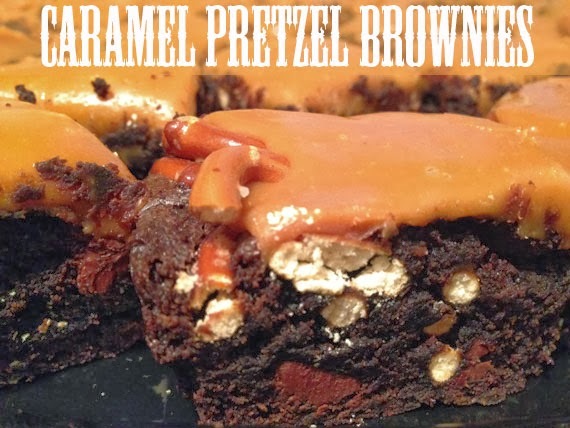 Layer pretzels over the brownie batter. Add another layer to make two layers of pretzels. 4. Pour the rest of the batter over the pretzels and bake until a toothpick comes out clean. 5. 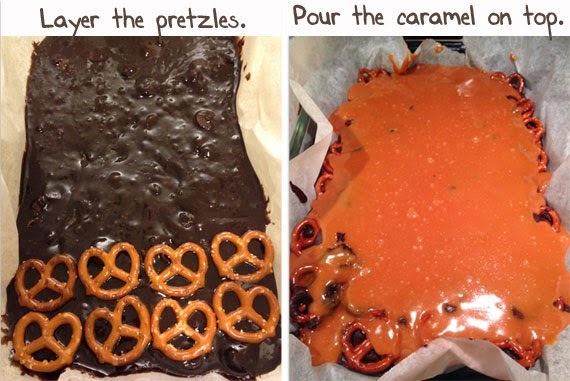 Melt KRAFT Caramel Bits according to the instructions on the package and pour over the baked brownies. Wait until they have cooled, cut and enjoy! We had a frog-themed party for Addie's 3rd birthday. I shared the cupcakes with you that I made for the party. We also played this really cute game. I found these little flies using clip art. I printed them out and cut them into squares. 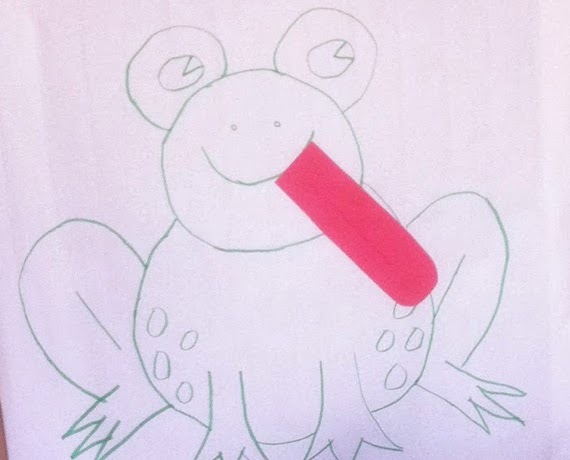 I had my artistic friend draw a giant frog (Thanks, Thi!) 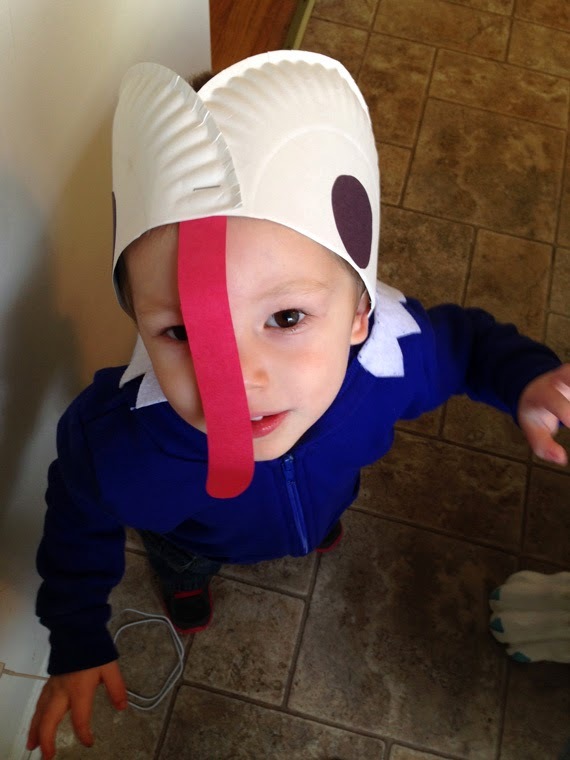 and I cut out a piece of construction paper to make the tongue. I realized when we were playing the game that this was a bad idea. The older kids (really just one) figured out that they could just feel the paper to see where the tongue was. Oops. We also played Pass the Frog. My friend loaned me a beanie baby red eyed tree frog (Thanks, Beth!). It was similar hot potato, but no one gets out. When the music stops and you are holding the frog, you have to say ribbit, ribbit as loud as you can. We played another game that I made up and called Lily Pads. I put six hula hoops down in the driveway and I asked the kids to walk, run, skip, hop, etc. around until the music stops. When the music stops, they had to get inside a hula hoop. Each time I stopped the music, I took away a hoop. The kids had to work together to fit. They all managed to fit inside one hoop. I bought some white paper bags and had the kids decorate them with frog and bug stickers. They each got a lily pad to decorate also. I took three packs of these frogs and scattered them all over the yard. The kids had a scavenger hunt to find them. The lily pad was for when they take the frogs home; they could play a game where they have to try to land their frogs on the lily pad. Even though she forgot this, it was my friend Beth's idea. Again: Thanks, Beth! I must mention that I don't like to play games with preschool-aged children where any of them get out. It usually causes meltdowns. When they get a little older, you can have them get out, but then they can do a task to get back into the game. It is more fun that way! It all started with a trip to Costco. I wanted to get some of this kale/brussles sprout salad they have and, as most all trips to Costco go, I had a cart full of STUFF. I got some wax warmers (scentsy and partylite-esque). I'm hoping to use the warmers with PartyLite Citrus Peel and Sage melts, they smell AMAZING! As we were perusing the book section I came across the Guinness World Records 2014 . That is right up Maya's alley. She loves looking at the unusual, freaky, amazing things of this world. She is an avid worm digger, boo boo checker, inquisitive kid who wants to know exactly how things work. I grabbed the book and she sat fascinated in the cart looking at all the pictures. 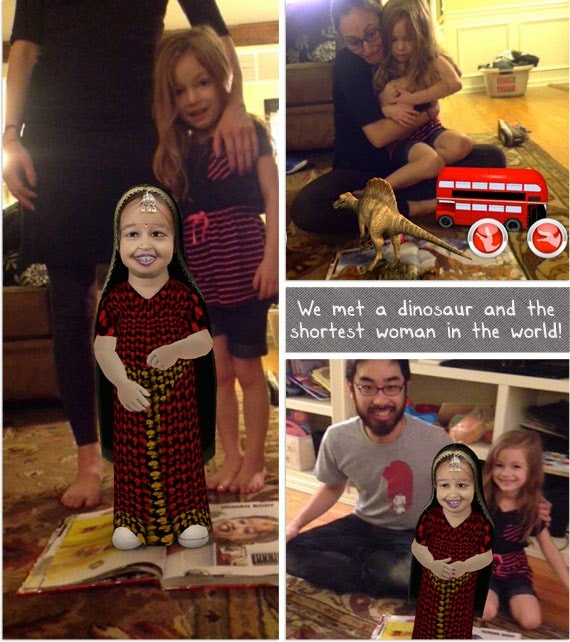 When we got home and Simon was in bed our friend Alan, of our infamous friends Alan and Kristen, noticed that you could get an app that made the pages come alive. I downloaded it and it was AWESOME. At first we saw some videos that were cool but when the 3D animals, insects and people came out of the book it got even better. First we met some dinosaurs taking over London. Then some bugs came out onto the page that were a bit too lifelike. The shortest girl in the world was our favorite. We posed with pictures with her and everything! In this age of technology we can get just about everything on kindle, nook, ibooks, etc. While I do miss that book smell I have adapted which makes it easier to read in bed when Jared is sleeping. This book, on the other hand, is way worth the paper pages. We had so much fun reading it together and when we added the technology it made for a very memorable experience! What to do with a dusty lampshade.